From “We’re sailing again” to “We now have no boat”, that is quite a jump. The short of it is, we’re moving back to Atlanta area in mid-June and we practically would not use the boat. After a lot of deliberation, we decided it was time to let her go, but it had to be done quickly. As of yesterday, Heike has been passed off to her new owner. It’s a little bittersweet. 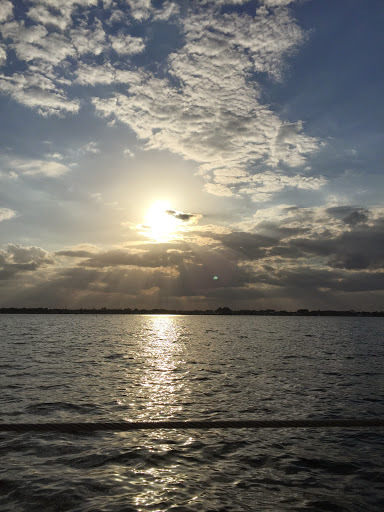 On one hand, selling the boat was a relief given our circumstances, but we really hate that we weren’t able to do some cruising. The unfortunate reality is that owning a small business like ours and taking days at a time off just to arrive at your destination isn’t feasible. It makes me sad to think that we weren’t able to make the trips that we wanted, especially after all the work we did, but this just isn’t the right time of life for us right now. There will be a time, later down the line, but we need to focus on making that time happen for right now. 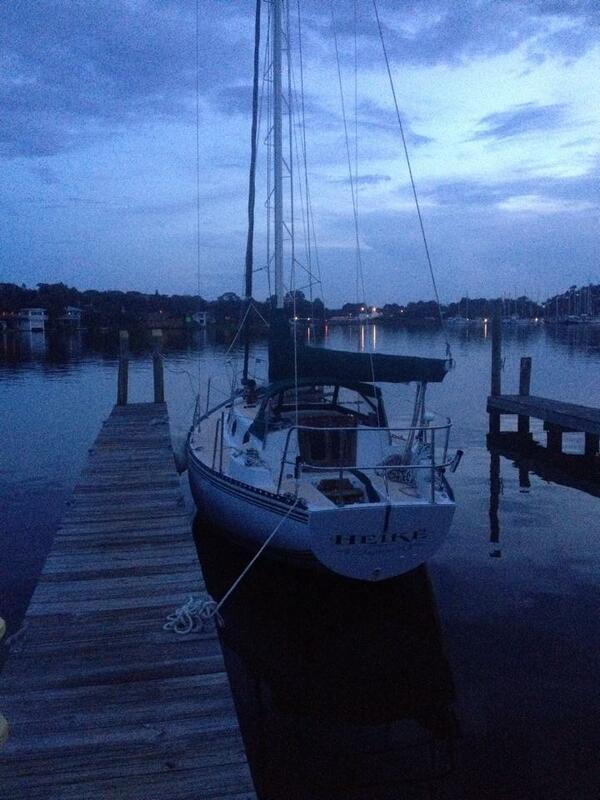 At long last, Heike is back in the water, put together, and ready to sail. As of last week, all of the key items have been addressed and we’ve made it out 4 times! The first time, the wind died on us after getting all the sails up, but it was nice to see everything functioning again. 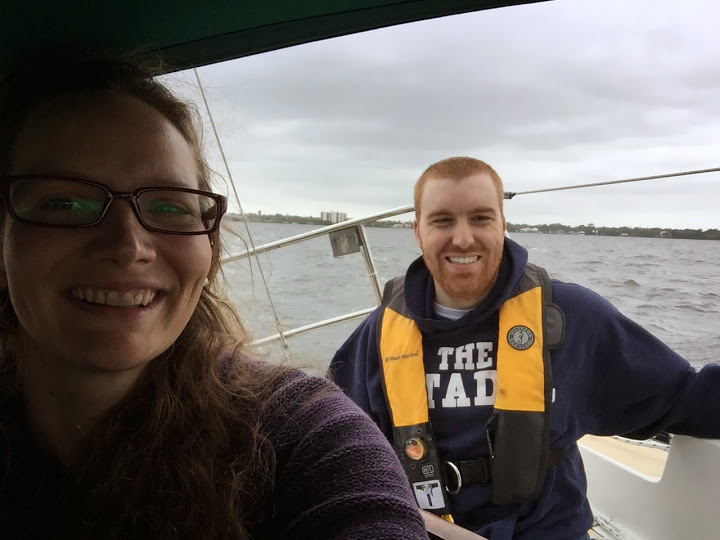 The second and third times out, conditions were a bit “brisk”, but the boat handled it very well. The dodger proved it’s value, as we were plowing through a pretty good chop that was blowing water up on the boat. 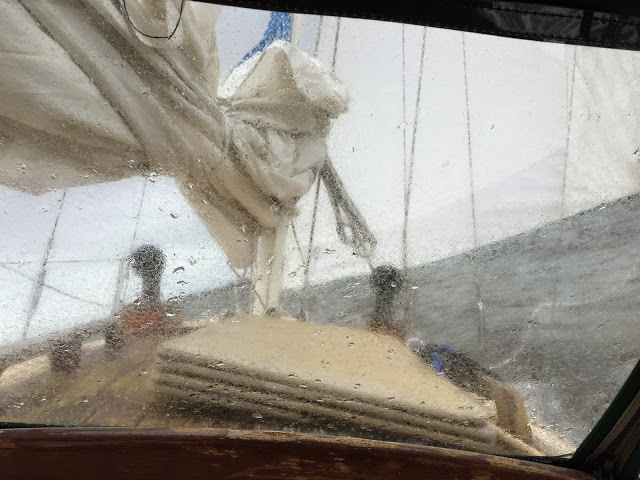 The boat handled the conditions really well and remained comfortable, just sortof plowing through it all, the motion was surprisingly comfortable under sail. Yesterday, Shelly and I went out so she could get a little bit of a refresher on helping me handle the boat. 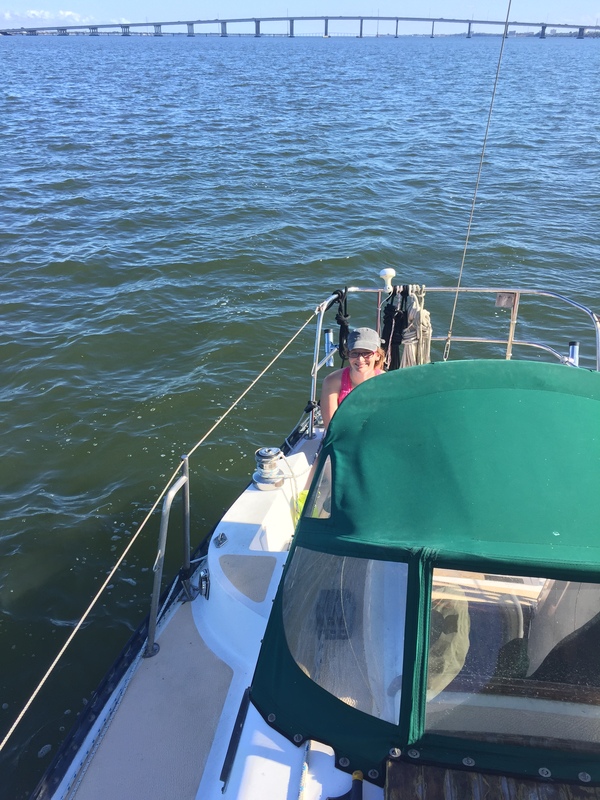 The winds were fairly light, revealing the need for a genoa at some point, especially as summer rolls around, but she sailed relatively well under the 100% alone. Even still, she made along at about 4 knots with ~10 knots of wind on a broad reach under jib alone. I’ve been surprised at how well this boat performs to windward and how well she balances on all points of sail. 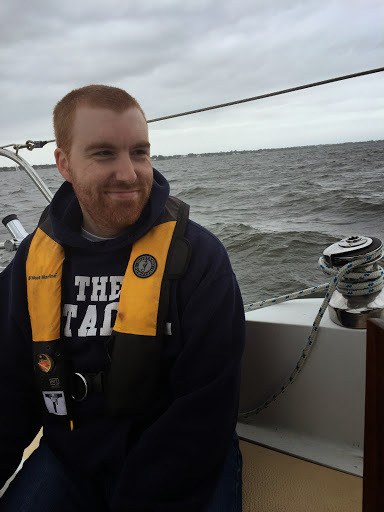 You can make small sail trim adjustments on the main or jib, then watch the boat respond and instantly feel it on the helm. That’s a contrast to some of the Alberg designs I’ve been on, where it feels like the main is overpowering on certain points of sail and getting balance right can be kindof finicky. None of these items are too critical and they should all be done in short order, making the boat more or less back to completely functioning. Some of these (winch springs, freshwater pump) are just age related, others are things we need to finish because we re-worked the system (propane). 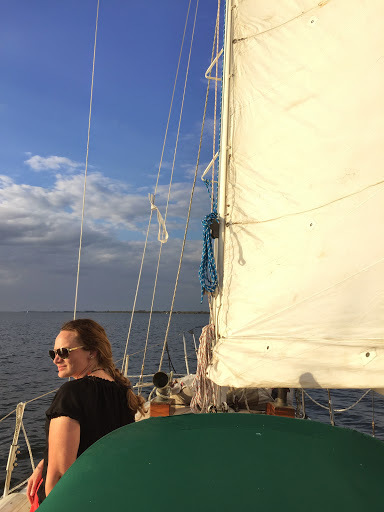 Overall, we’re happy with the way the boat sails and she has a lot of features we wanted, which reminded us why we were drawn to her in the first place. It’s been a long haul, mostly due to work done by prior contractors, but everything has ended up well. Well, it’s been around 5 month since our last update. We did splash in September, but we also found out some other bad news. Part of our haulout was complete replacement of the prop shaft, cutless bearing, and associated re-alignment of the engine. What was discovered was that the engine mounts were slightly too small for proper adjustment, so we had to address that so the engine could be properly aligned. In the process, we decided to just replumb everything, relocate the exhaust chamber, and rewire the electrical compartment. The engine was completely pulled and everything was painted white, which makes for easy detection of things like oil leaks, exhaust issues, etc. 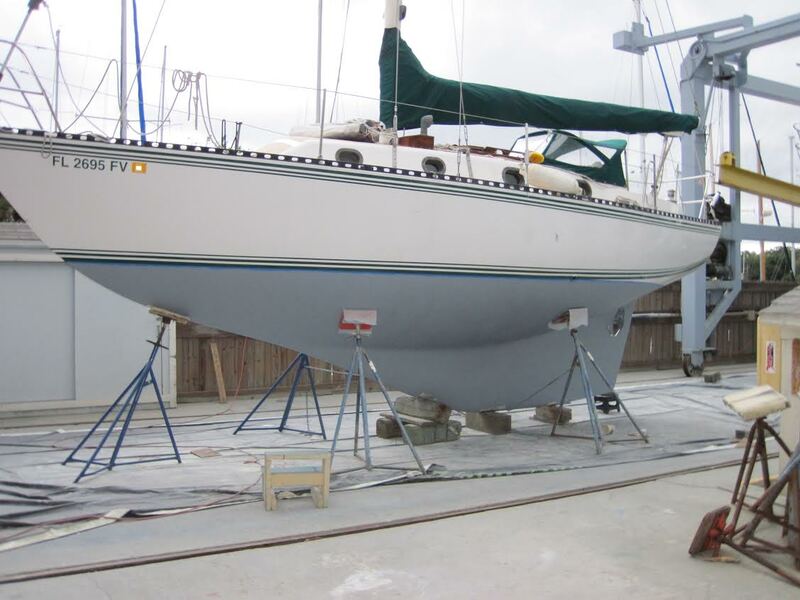 Well, we’re now splashed, with our new barrier coat, new rudder, new bottom paint (Trinidad Pro), new rudder shaft, new scupper drains, and rudder zincs. It’s been a long time out of the water, but we’re finally back in and on the way towards completion and moving aboard! Barrier coat is on! We are getting there! I haven’t updated the blog in a while, partly because I’ve been so busy, but also because of the sheer frustration we’ve experienced in the last three months. I’m gonna make this post a braindump, so apologies for the poor grammar and flow. The good news out of this is that the boat is going to be near perfect by the time we are done, but it’s been a long and difficult road getting there. I can’t stress enough how fortunate we are to know our friend John and have family that have let us stay with them while we sort this mess out. Basically, the rudder rebuild finished this week (see picture from my last post) and we got a new tiller. The new rudder is amazing, it’s smooth, well balanced, and really well shaped. When you push the rudder to one side, then let it go, it falls right back into place. The operation of the rudder is smooth as butter. I can’t even compare this to the barn door and bent shaft on the last rudder. 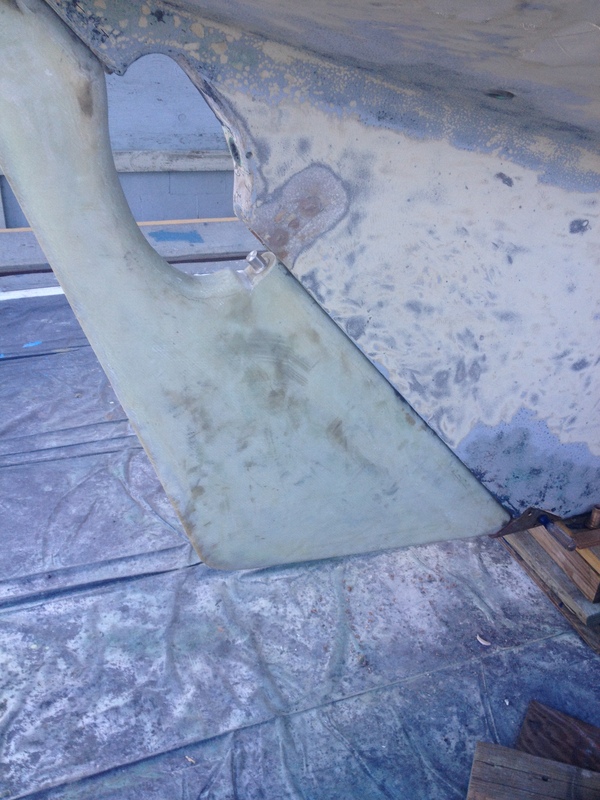 We also ran into a problem where the stuffing box and tube were installed crooked on the boat. I believe this happened day one and someone at the factory really screwed up, we estimate it was never installed correctly. That’s been sorted out and it’s straight as can be, which is a major contributor to the smoothness of the rudder. As prior pictures demonstrated, we have a new tiller. It’s artwork and I love it, the height is perfect to pass over your knees sitting down, it’s all teak and is absolutely beautiful. The electrical system is being completely revamped, I’ve pulled the entire panel off and am rewiring the back of the panel similar to how we did on Mariah. We’re terminating all remote wire runs at terminal strips, which are run to bus bars, then the power source. The result will be much cleaner, I’ll post pictures later. 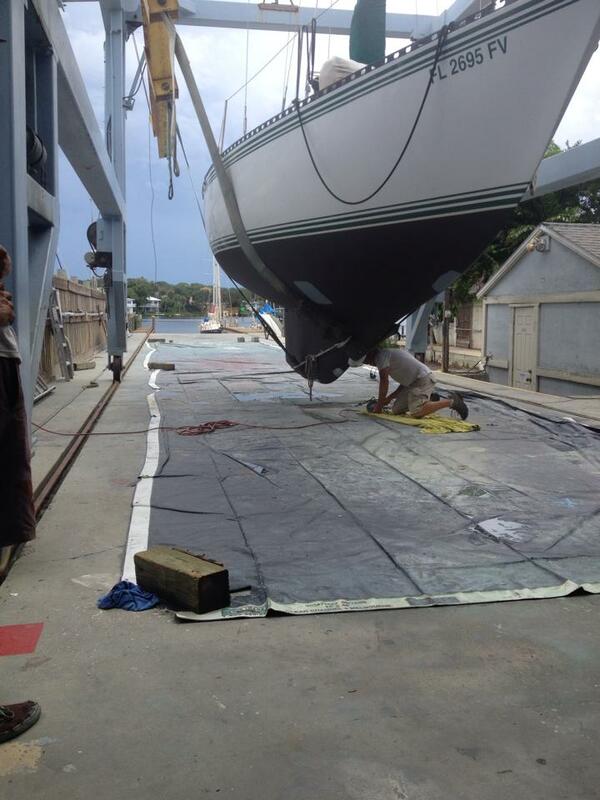 We’re installing a new thru-hull and seacock for the engine. Previously, the engine was T-d off of the head. I’d rather have them separate and now was the time to do it. We’re relocating the fridge compressor. The fridge that was in the boat originally died the week we bought the boat, due to corrosion on the lines. The location of the compressor was exposing the lines to water, which resulted in a lower life of the compressor. In addition, ventilation was poor. We’re going to install the compressor inside the cabin behind a louvered door and with a fan to help circulate air over the unit. We’re relocating the batteries. Previously, the batteries were located in a locker with the fridge compressor. We’ve removed all of the cabinetry inside the locker and put the batteries inside the cabin, beneath a settee. The result is a much cleaner installation of the electrical system that can be accessed much easier. In addition, the batteries will be located lower and directly parallel with the water tank, balancing weight out. The battery switch will also be in a much better location that can be easily accessed from inside of the boat. We have replaced the hoses for the scuppers. That was a nightmare, we had to pull the thru hulls, install angled barbs, then install the hoses. The original design was flawed in that the hoses really weren’t replaceable. That’s been fixed. We’re bottom painting in the next week or so, Trinidad Pro, which should hold up for a few years, at least. We’re done taking down the barrier coat and will be rolling it on shortly. We’re installing a new prop shaft. 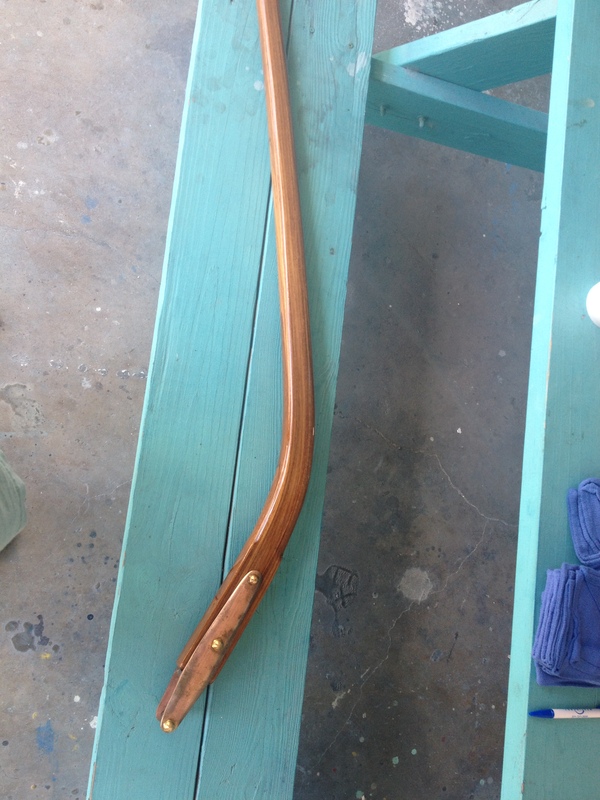 The prior shaft was too small and would make a horrible racket when put into forward. We’re gonna have to extend it by about 1/2”. The exhaust chamber was installed above the engine, which means water could backflow and flood the engine. That’s being fixed. We were supposed to move aboard last May, but the revelation that the rudder needed rebuilt basically threw that out the window. What’s happened is a series of discoveries that the boat needed massive amounts of work. I won’t lie, it’s been frustrating, but I like knowing that everything will be fixed correctly and not be unknown. It’s frustrating that the work has taken so long, but in the end, the boat will be better than new and will be far more functional.